Due to all the traveling I've done the past month I am about a month behind in my Christmas Card Challenge. 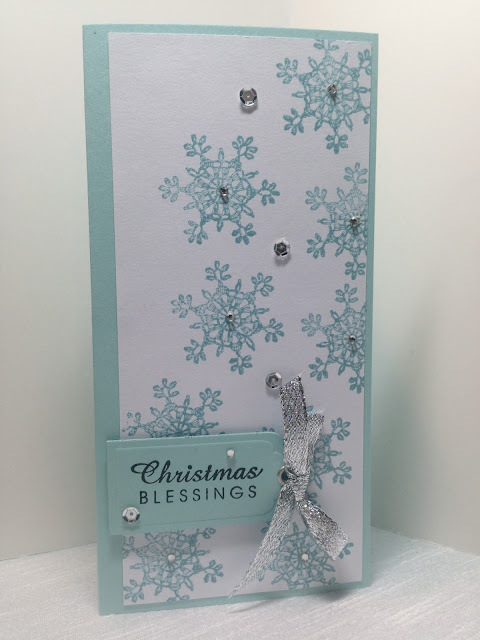 As most of you already know, I play the Christmas Card Challenge on Splitcoaststampers where we make Christmas Cards all year long so that were not stressed out during the busy holiday season. I make five cards a month so that I'll have over fifty cards at the end of the year. These are my August cards. I make a tall card 4 x 8 so I can fit a Christmas Photo Card and Letter inside. I was inspired by this card HERE, because it was so clean and simple…which is exactly what I needed to play catch-up! I altered the design by using making it a tall card instead of an A2. I also used different stamp sets, and solid color paper instead of designer paper. I also left some of her details out: like the stitching and double dimension. Not that I didn't love that, I did, but I'm going for quick and easy this month! I used two different retired Stampin' Up! Sets to make my cards: "Lace Snowflakes" and "Xmas Words: Star Studded Season". I randomly stamped the snowflake on a white card base using Baja Breeze Ink, then adhered it to a Pool Party card base. 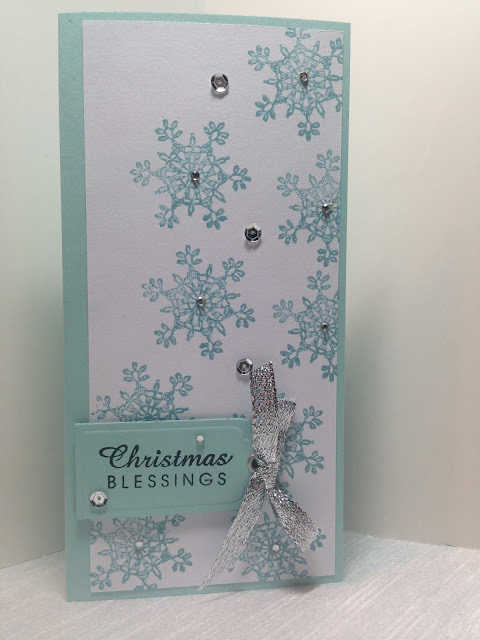 The sentiment tag was cut with a Spellbinder Nestability Die. I used silver ribbon instead of silver string because I thought it was prettier. 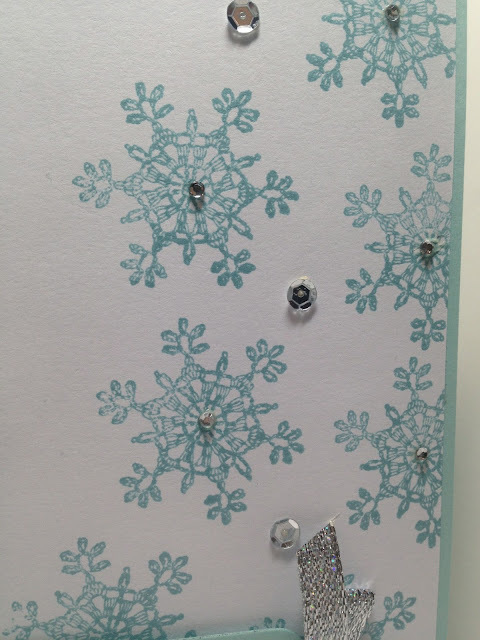 A clear crystal was put in the center of each snowflake, and silver sequins were scattered about the card. The sentiment tag was popped up on dimensionals. If you haven't checked out my "Stamps For Sale" page, please do. I have lots of Christmas Stamps for sale! So pretty...I love the colors. I used an embossing machine last year for the first time in making Christmas cards. Superb ! love the colors, so sweet ! These are so festive for the holidays! These are beautiful! Love the color combo and sparkle! Fashion Over Fifty: Long Sleeves with Shorts? Finding Fall Floral Beauty Everywhere!